With the help of Carruthers Landscaping, homeowners Bev and Bart Evans undertook a complete backyard overhaul. 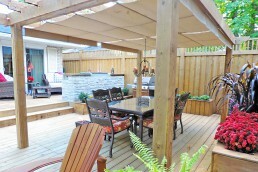 The revamp revolved around the addition of a four-post pergola that would cover the outdoor dining area. 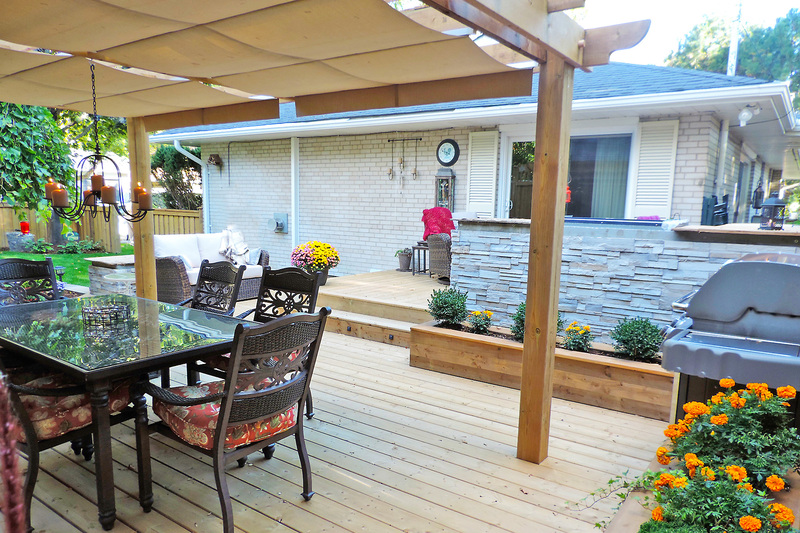 During the consultation phase, Carruthers recommended the addition of a ShadeFX retractable canopy to the structure. After some preliminary research online, Bev and Bart decided to visit the ShadeFX facility in Milton, Ontario. From there, they met with a Product Specialist who walked the showroom and explained the benefits and competitive advantages of our patented single-track system. Leaving the facility with a full understanding of how the system works, without delay, the Evans began the design phase. 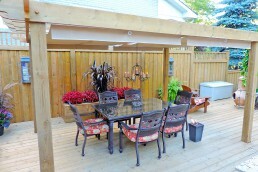 Initially, they elected to cover the pergola with a single 10’x 16’ canopy. However, the desire to incorporate a hanging light was added to the plan. Working alongside our Product Specialist, it was determined the best solution would be two 10’ x 8’ retractable shades. As a result, there was enough space left between to hang the light fixture. 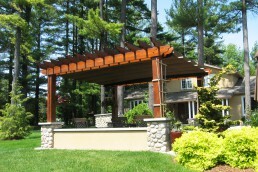 Overall, this project serves as a great example of the variety of ways shade can be incorporated onto a pergola. As needs and desires evolve through the design phase, ShadeFX’s retractable solutions are able to adapt, delivering high-quality retractable shade. 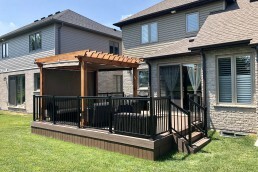 Is your backyard missing an adaptable retractable shade solution? We can help. 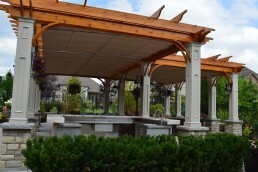 Initially, the Evans wanted to cover the pergola with one single canopy. As their design changed, ShadeFX adapted. 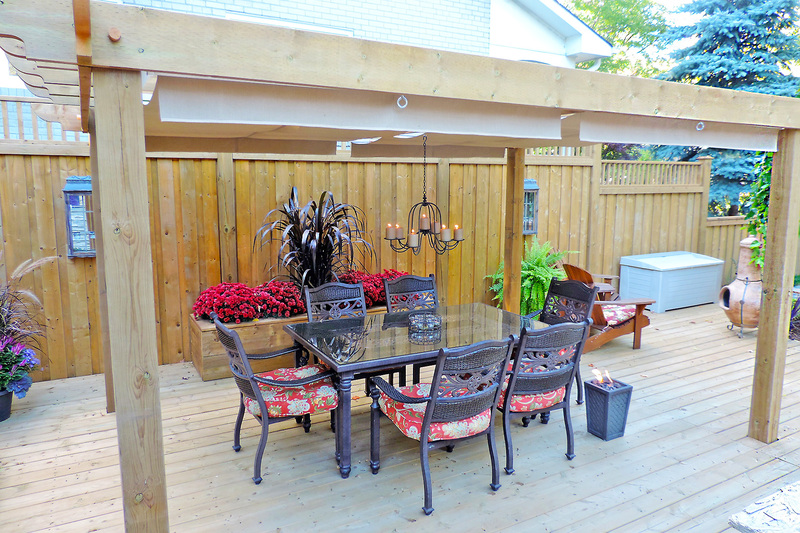 In the end, two 10’ x 8’ retractable shades were customized to accommodate a hanging light fixture.